South Sudan's President Salva Kiir decorates newly appointed army chief General James Ajongo during his swearing-in ceremony at the Presidential Palace in Juba, South Sudan, May 10, 2017. General James Ajongo was sworn in Wednesday as the new SPLA army chief, a day after South Sudan President Salva Kiir fired his predecessor, General Paul Malong, with no explanation. Ajongo said he would work to implement the security arrangements stipulated in the 2015 peace agreement and strive to end the fighting. He also said he would address the increasing numbers of armed groups across South Sudan who are trying to topple Kiir's government. Amid tight security in and around the Presidential Palace, Ajongo was sworn in by South Sudan's chief justice in front of a small audience of government officials. Afterward, Ajongo told reporters he recognized that the conflict is South Sudan's biggest problem. South Sudan's new army chief, General James Ajongo, speaks to reporters after his swearing-in at the Presidential Palace in Juba, South Sudan, May 10, 2017. "It is a difficult task, given the fact the country is actually in conflict by itself, but making use of our good human resources [of] my colleagues behind here, I believe that they are the right people who [are] posted in the right place. We will be able to manage the situation, and we will exit from this conflict," Ajongo said. Like Malong, Ajongo is from Aweil in the former Northern Bahr el Ghazal State. Presidential spokesman Ateny Wek Ateny described Ajongo as a career soldier. "He is the former deputy chief of general staff for administration and finance. ... He has been in the SPLA since 1983 and he has not taken any position like General Malong." Malong, sometimes referred to by supporters as "King Paul" for his lack of remorse, was appointed by Kiir in 2014. Since taking office, he has never seen peace in his country. Malong was born sometime in the early 1950s in Warawar, north of Aweil town. His exact birthdate was not recorded. In 1969, he attended basic school in his home village before completing intermediate studies at St. James in Khartoum. Malong completed school in Khartoum and returned to Aweil to form Anya-Nya, a military and political movement, which later became part of the Sudan People's Liberation Army. 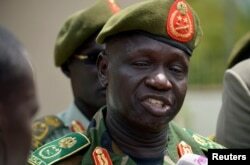 In 2005, Malong set up the South Sudan presidential guard unit of the army, becoming commander of the Republican Guard. He served as a deputy of the National Intelligence and Security Services in Khartoum after the signing of the Comprehensive Peace Agreement in 2005. Malong was promoted to general by Sudan President Omar al-Bashir that same year. In April 2008, Malong was appointed governor of Northern Bahr el Ghazal state. After fighting broke out in December 2013 in Juba, Malong was appointed SPLA chief of staff in April 2014, a position he held until Tuesday. FILE - Then-SPLA Chief of Staff Paul Malong, right, is pictured with South Sudan President Salva Kiir during an independence day ceremony in Juba, South Sudan, July 9, 2015. Malong vowed to restore law and order. Since his appointment, however, fighting has continued across South Sudan, even spreading to areas that were previously calm. Malong was accused of recruiting pro-government militias known as the Mathiang Anyor who reportedly attacked civilians in Wau, Yei, Kajokeji, Parjok, Magawi and Morobo in the former Central Equatoria state. Malong arrived in Yirol in Eastern Lakes State on Wednesday, where he was cheered by supporters. Malong reportedly headed home to Aweil with a heavily armed convoy. That has aroused fears among some residents of possible clashes between government forces and those allied to the general. Aweil resident Abraham Wol Kom is one of them. "The presidential decree which relieved the chief of staff is very surprising," he said. "The decree will increase the current political crisis. It may spark further splits across the nation, and as I speak now, Juba has been deserted. The chief of General Staff has left with a huge number of army." Resident Mayen Tong feared Malong's firing could lead to another rebellion. "I am not feeling comfortable. I don't know what this guy will do, because he has been the chief of army. He can rebel against the government," Tong said. Brian Adeba, associate director of policy at the Enough Project, said that although Malong was a powerful figure, not much would change under Ajongo. "If you see his replacement, a protege of Malong, he was active in the war front in Unity State in the Greater Upper Nile in the beginning of this war. He's been pictured with Malong at theaters of operation. So he's literally following in the footsteps of Malong," Adeba said.